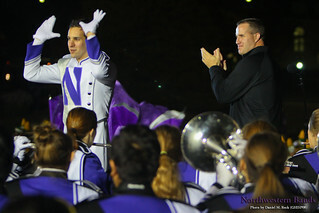 GameDay, one of the most popular television shows in all of sports, will make its first appearance on Northwestern’s campus since 1995, although the Wildcat Band appeared on the program when it broadcast from Wrigley Field prior to the 2010 game between Northwestern and the University of Illinois. 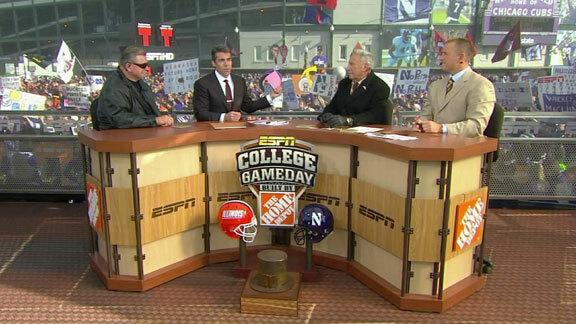 Saturday’s College GameDay: "Northwestern!” ESPN broadcast will be aired live from 8 to 11 a.m. Oct. 5 from the area just south of Northwestern’s Lakeside Field. Later at Ryan Field, the 7 p.m. Saturday Oct. 5 prime-time sold-out game between the undefeated and 16th-ranked Northwestern Wildcats and the Ohio State Buckeyes will be televised nationwide from Ryan Field by ABC-TV. The broadcast crew for the Saturday night game will continue the rivalry in the press box. Brent Musburger, the play-by-play announcer, is a 1961 graduate of Northwestern’s Medill School of Journalism, Media, Integrated Marketing Communications, and Kirk Herbstreit, the color analyst, is an Ohio State alumnus. Before the game, fans are invited to Wildcat Alley just north of Ryan Field and behind Welsh-Ryan Arena to enjoy food, games and entertainment. The Wildcat Band and the NUMBALUMS will give a free concert at 6 p.m. Inside the stadium, the marching pregame show will begin at about 6:15 p.m. First, over one hundred alumni of the Wildcat Band — members of the NUMBALUMS — will take to the field, followed by the nearly two hundred students of the Wildcat Band. In addition to ABC's broadcast, fans can also tune in on ESPN Radio (1000 AM) and WNUR Sports (89.3 FM and wnursports.com). The play will be presentd live at @NU_SportsLIVE on Twitter. Fans can also find Head Coach Fitzgerald on Facebook and Twitter, and Wildcat Football is also on Facebook and tweets as @NUFBfamily. Be sure to also follow Twitter hashtag #B1GCats for the latest Wildcat athletics action. Homecoming 2013 weekend offers a variety of perks for sports fans, including live broadcasts of several shows by ESPN's national networks and Chicago-based ESPN Radio 1000. Friday morning, the Wildcat Band will be heard on Mike & Mike, ESPN Radio's popular daily sports talk show hosted by Northwestern University alumnus Mike Greenberg. He and co-host Mike Golic will broadcast their early morning show live from Northwestern’s Evanston campus from 5 to 9 a.m. CT Friday, Oct. 4, as part of the third annual ESPN Audio Fall Football Tour. Their drive-time show will be broadcast from Northwestern’s Deering Meadow -- the two acres of open green space between Deering Library, (1935 Sheridan Road) and Sheridan Road. Greenberg will also serve as Grand Marshal of Friday evening's 6 p.m. homecoming parade, which will also include the Wildcat Band, the NUMBALUMS and a several high school bands. Greenberg will ride in the lead car during the parade as it works its way from the intersection of Sheridan Road and Lincoln Street toward the Weber Arch at Sheridan and Chicago Avenue. The Wildcat Band will then pump up fans for the the 6:45 p.m. Pep Rally in Deering Meadow. Greenberg will announce the results of the Homecoming court voting and crown this year’s Homecoming King and Queen. The ‘90s rock cover band, Mike & Joe, will also perform for Homecoming revelers.